Hymenocallis caribaea, a spectacular garden jewel! An outstanding perennial beauty with handsome foliage and spectacular flowers! Indeed, a garden jewel that will be excellent for tropical and subtropical gardens, parks and landscapes! Even without flowers, the glossy dark-green foliage of the Caribbean Spiderlily continues to be a great attraction. Nevertheless, the blossoming of its gorgeous and spider-like white flowers is another impressive spectacle altogether, something not to be missed if opportunity presents itself! Catch them flowering in the evenings and get to enjoy its explicit beauty with intoxicating fragrance at its best from dusk to dawn. Read about it and enjoy a few additional photos here. Features: Hymenocallis caribaea is one of the well-known species of the New World genus Hymenocallis which together with 2 other closely related genera Ismene and Leptochiton form the tribe Hymenocallideae. 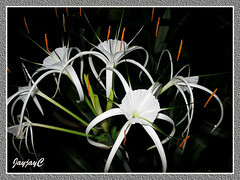 However, only members of the genus Hymenocallis are true spider lilies. Being a tropical and subtropical species in the Caribaea alliance or the Tropical Hymenocallis category, this bulbous perennial herb, H. caribaea, is evergreen and needs no dormancy period. It is vigorous-growing, producing spectacular foliage, flowers abundantly and offsets prolifically, making it the most widely grown of this group. Its sword-shaped mucronate leaves with slightly depressed midrib are 40-70 cm long and up to 6 cm wide at its broadest, smooth-textured and glossy, erect and somewhat recurved at the top end. The sessile leaves are dark green and distichously arranged in a beautiful fanlike appearance. There is another form, H. caribaea ‘Variegata’ with lovely variegated leaves in greyish green and widely edged creamy white or yellow. 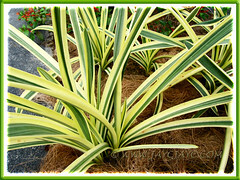 The variegated form is smaller and less vigorous. An umbel of 10-12 or more pure white flowers are borne at the tip of an erect flowering scape about 60-75 cm tall, towering above its luxurious foliage. Magnificent and stunning! The flower head is huge, up to 32 cm or more in diameter. 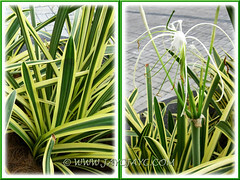 The spider-like flowers will spring open in the evenings and emit a marvelous intoxicating fragrance that is strong till dawn and gradually decreases during the day. Though the delicate flowers are short-lived, lasting for 2-3 days, the whole blossoming process is dragged longer to about 10 days as one or two flowers are spent, another one or more buds (21-24 cm long) will unfurl. Each flower held on a 10-12 cm long greenish pedicel has six elongated tepals or segments (13 x 0.8 cm) in white and beautifully arched in a single plane. Arising from within the throat of the pedicel is the characteristic funnel-shaped corona (5 cm across) that connects the basal part of the stamens, hence the name Hymenocallis which literally means ‘beautiful membrane’ in Greek. Each unconnected part of the six erect stamen stalks is greenish in color, up to 6 cm long and topped with a 2 cm linear anther that is fabulously covered with bright orange pollen. Towering above the stamens is the greenish style, about 11-12 cm, appearing from the throat of the staminal cup. H. caribaea does not set seeds or normally does not do so? It is quite similar to the cultivar, Hymenocallis ‘Tropical Giant’, which is the most cultivated hymenocallis around the globe, especially seen in botanical gardens. The latter has larger leaves and flowers, with the 6 tepals recurved in two planes, that is, 3 alternating segments out of 6 are more recurved than the others. Culture (Care): Hymenocallis caribaea is an easy-care bulbous plant, needing minimal maintenance. Light: Best in full sun (not scorching sunlight though), but tolerate light shade. Moisture: Lots of water regularly. Do not allow to dry between waterings. It likes humid conditions. Soil: Prefers fertile, moist and well-drained soil, though tolerant of other soil types. Others: Feed monthly with a balanced houseplant fertilizer. No pruning is required, just snip off yellow or withered leaves and spent flowers to maintain tidiness. No serious insect or disease problems though occasionally bothered by snails, caterpillars and mealybugs. For subtropical regions: Hardiness: USDA Zone 10-11. Provide moist and humid conditions during hot weather but less in cooler climate. Propagation: By removing the offsets that form on mature bulbs and grow them separately to get new plants. Usage: Spectacular herbaceous flowering plant that is suitable in large containers or raised planters, located outdoors in the garden or porch. Excellent too, when grown in the ground en masse in beds and borders to add interest or as groundcovers. Wonderful specimen when grouped for landscaping at parks, public places and along roads and highways. Three closely related genera Ismene, Elisena and Leptochiton were previously classified under Hymenocallis but has been reclassified since 1812. Ismene, Elisena and Pseudostenomesson are now considered subgenera of Ismene that is recognized as a distinct genus, as with Leptochiton. Hymenocallis Hybrids include hybrib plants that are part of the Hymenocallis complex, comprising the 4 genera Hymenocallis, Ismene, Elisena and Leptochiton. 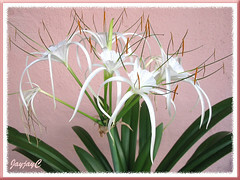 The approximately 70-80 species of Hymenocallis are widely found in the southeastern United States, Mexico, Central America, the Caribbean/West Indies and northern South America. They are so diverse in habitats due to the vast distribution and the physical appearance or attributes of the bulbs, foliage and inflorescences can be so similar as to lead to much confusion. Learn more from the links listed below, most of which have presented pictures to illustrate the differences too. Add Crinum asiaticum ‘Variegatum’ to brighten your garden! So i was looking though pictures of flowers (mostly lilies! ), trying to identify the one currently at bloom in our backyard! I ended up here matching the two, and found out even more! 1. How rare is 70 – 80 species? 2. How much would the bulb retail for? Sorry, we’re unable to provide answers as we’re just ordinary home-gardeners, neither botanists nor retailers. We try our best to research for related information online to share here, and include some of our own gardening experiences too. 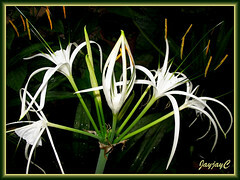 You may want to read about the genus Hymenocallis and its species at http://www.pacificbulbsociety.org/pbswiki/index.php/Hymenocallis which included 2 articles from Kevin Preuss for further insights. 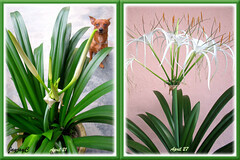 I love my Hymenocallis, the bulbs grew and flowered well, now the foliage and flower stalks are leaning over and are yellowing. What do I do now? Please contact to tell me when to unearth the blubs. Hi Sandy! It’s natural if the lower leaves are turning yellow due to age and flower stalks leaning over as they wither. Just remove them if that’s the reason. Otherwise, check to see that the bulbs are not overly wet as too much water can choke the roots and cause leaves to yellow. Do not unearth these bulbs unnecessarily as they love to be potbound. Do so only if you wish to divide the clumps to propagate new plants. Last spring I’ve bought a Hymenocallis caribaea bulb, and it started to grow very fast, giving a very large amount of new bulbs. But somewhere in the end of summer, leaves started to turn yellow suddenly. Now all of them are gone and no new leaves are appearing. Could You please provide any help, because i don’t have any idea what’s wrong with the flower. Thanks in advance.